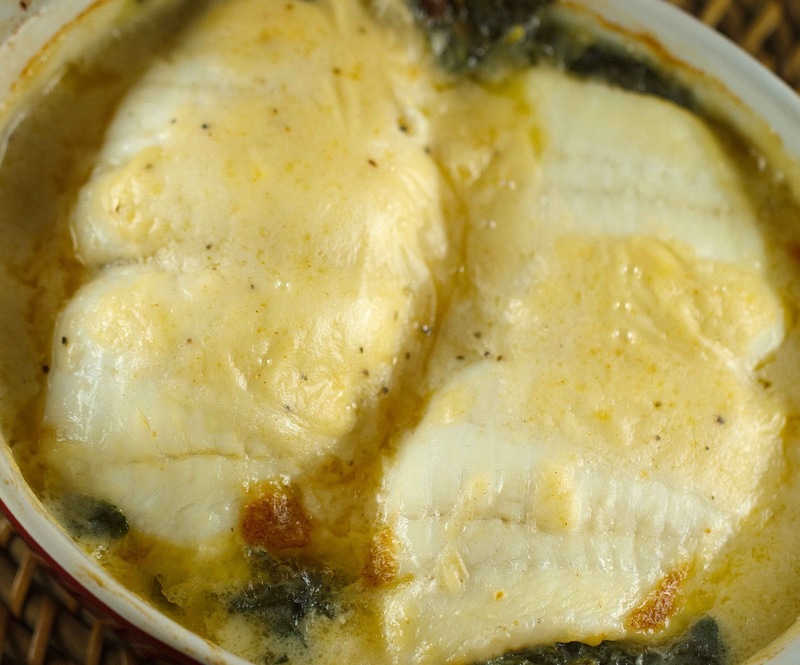 whether you use fluke or flounder you're going to love this delicious Flounder stuffed with spinach and cheese then baked in a mornay sauce. Simply delicious! Flounder is a very plain fish, with not a lot of flavor, but oh so light and flaky. You can find it as a staple on any seafood combination, or just plain broiled for the heart healthy eaters. 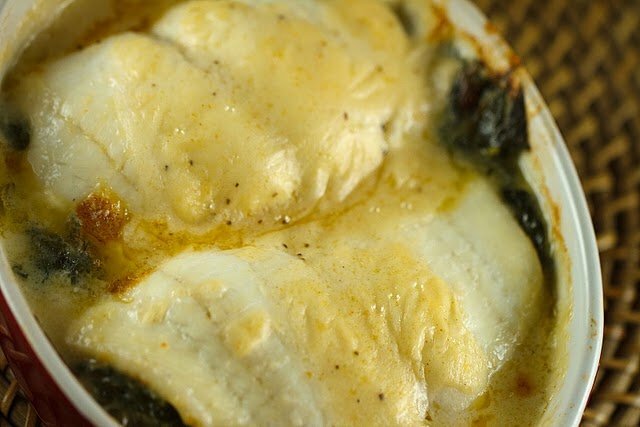 One of my favorite ways to prepare flounder is to stuff it and today I am going to share with you one of my favorite stuffed flounder recipes. This easy to make recipe will go well with any of your favorite fish fillet. If you can roll it you can stuff it. You can even prepare this ahead of time and have it ready in your fridge to pop in the oven when you get home. After I removed the flounder from the oven, I decided it would be better served plated, so I took the rolls out of the dishes and placed them on plates topping the stuffed flounder with the mornay sauce from the dishes. It’s up to you, I just thought it would be easier for my wife to eat that way, in the restaurant it was served in the baking dish. Saute the baby spinach in a little olive oil, let the spinach cook down completely, this should only take a few minutes, then remove from stove to cool. In a saucepan melt the butter, then add in the flour and mix well to make a roux. Allow roux to cook on low heat for about 5 minutes to cook the flour. Add your heated stock to the roux to make a bechamel. Remove 1/4 cup of the bechamel to add to your spinach. Add the shredded cheddar (or cheese of your choice) and season with salt and pepper to taste. You now have made this into a Mornay sauce. Set aside and allow to cool. At this time your spinach should be cooled and you need to squeeze as much of the water out of the spinach as possible. It can still be a little moist but not wet! 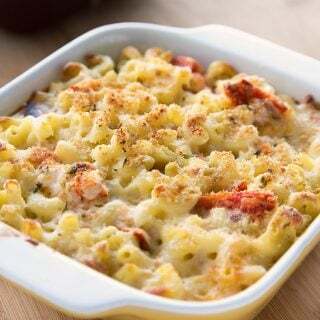 Now add in the 1/4 cup of bechamel you reserved (if it looks to dry add a little of the mornay into the mix, but the mixture should be soft and solid not runny. Divide the stuffing between the flounder fillets and roll them, so that the flounder surrounds the stuffing. Place the fillets in two individual baking dishes or one large enough to hold all four rolls without them moving around too much, make sure the fillets are seam side down so the flounder does not open up while baking. Remove from oven and drain off the water, add your mornay sauce till it comes about 3/4 of the way up the stuffed flounder rolls and return to the oven to bake for an additional 10 minutes. I made this for supper tonight using tilapia instead of flounder, and it was a huge hit. It’s definitely going in the ‘make this again’ recipe file. The fish was perfectly cooked, and even my normally-picky mother came back for more. I did a medley of roasted summer vegetables as a side dish, which was colorful but simple enough to let the presentation of the stuffed fish be the star of the table. Great recipe, thanks for sharing it! happy to hear that you enjoyed my recipe, and tilapia was good substitute for the flounder! I made this for dinner two nights ago, and it was so delicious, that I bought more flounder and spinach, so I could make it again! Thank you, Chef Dennis! thanks so much for letting me know that you enjoyed the stuffed flounder so much you’re making it again! I like the look of this. I think it is a nice recipe for guests too. Could you sub any white fish for flounder? I haven't seen flounder in the markets in Dubai. You are such a great resource. Keep on doing what you are doing because you certainly do it well!! What a great post! You know I would love that toffee 🙂 I think Ryan can relate to your wife's love/hate relationship with blogging. Sometimes, he wishes I didn't spend so much time on it…but mostly he loves the food we create for it! This flounder looks delicious, Dennis. I wish you could cook this for us on Friday night 🙂 Thank you for sharing, sweet man! Yum, I love flounder, especially with a buttery sauce. Looks delicious! 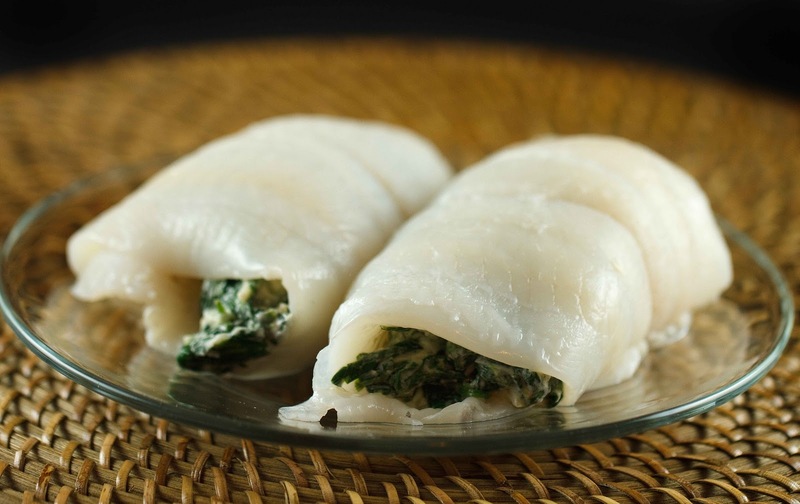 The flounder florentine sounds amazing, I love the mixture of the cheeses in the spinach filling, excellent! Your blog always makes me drool. This looks positively gorgeous, I will have to try it! I'm glad you're busy with your blog because I love it! I really enjoy reading your posts and copying your recipes. 🙂 Such as this one… great choice of fish and I love the stuffing…my husband will be over the moon when I prepare it for him. That flounder looks so good. 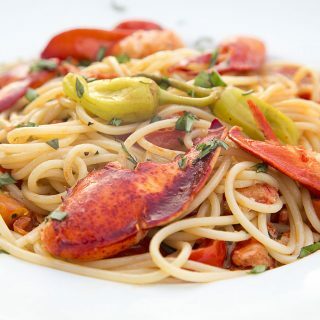 Perfect to have a recreation of a favorite restaurant dish. And sustainable as well! Please enter me in the toffee. Who wouldn't want it with such an endorsement? Sounds delicious! Hey Dennis! I don't know what's different exactly, but your blog looks really great, man:-) It had a very bright and happy feeling to it now-that's nice! So glad you shared this! I was not a big fan of fish when I was a kid, but when my mother introduced me to this dish I was a convert, and have enjoyed it many a time since. I'll look forward to Cheryl preparing your recipe! And, I should add, ANYTHING with Mornay Sauce is an automatic buzz in my book! You just keep cranking out the great fish dishes. I like your spin w/ flounder and will try it soon. Dennis-Stuffed Flounder Florentine is such a classic, elegant dish. Years ago, I used to stuff it with baby shrimp, in a cracker type stuffing, which also was a classic. You did an outstanding job of the way you prepared it. Light, and delicious…perfect for Valentine's, as long as it is cooked for family, (and not a date)…spinach is always a scary thing to eat when you're on a date! Yumm, Dennis! This looks so good, flavorful and temping! My weekdays and weekends are so crazy too but getting in the kitchen and enjoying a sit down meal is absolutely necessary to complete my day! No matter what I have cook and this is a dish I must try! My mom used to do stuffed flounder when we were kids and I've really enjoyed making it. It's a great, elegant looking recipe. And so simple! I know what you mean! I always seem to work harder on the weekends than I do during the week..maybe that is because I am actually working on something I WANT to work on haha. Anyways, this meal looks delicious! I too have been trying to cut out the junk and focus in on more healthy things. This looks like just the ticket! Thanks for sharing the recipe, as always your pictures are fabulous and you are such an inspiration! We also are all about the 'have at least a few minutes for dinner' policy, though I've got to say, how could you not take a break from the day when you're eating this – it looks and sounds unbelievably good! I think this is a classic dish. I love that the spinach has roasted red pepper in it – tasty surprise. And the sauces. I would be so pleased to see it go into rotation here… which means Claudia cooks it! Which works for me! I would prefer flounder but could make do with tilapia. Or walleye freshly-caught. Happy Valentine's Day to you and your wife. My family has also noted the time I put into the blog. And the tasty dishes that result from it! This reminds me of the first dinner my husband cooked for me when we dated 25 years ago. I was so impressed – in fact, it made me worry about what I could make for him that could possibly compare. I've since figured out how to wow him :} Hope you and your valentine share a wonderful dinner. This look divine. And flounder is such an affordable fish. Love it! 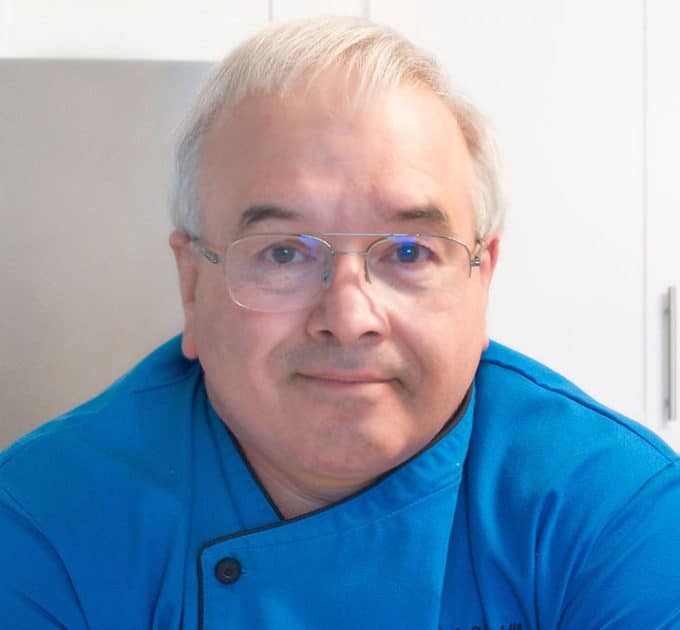 Chef Dennis, his is a lovely fish recipe 🙂 You have just given idea what to do with the fishes in the freezer. Yea…more fishes and this recipe is great. Thanks …oink oink ! This sounds lovely chef, I don't think I've ever done stuffed flounder, but I love the sweet meat of flounder, so it'd be an awesome meal this one. I don't often cook fish at home, except for salmon. But I love this dish! Anything with spinach. And you gave us lovely sauce lessons, too. Happy Valentine's Day! I like the new layout, Chef! Well done. The flounder looks fantastic. I love spinach in anything and tucked inside the fish is deliciousness just waiting to happen. Thanks for another wonderful recipe. I know what you mean about the days off. Sometimes I actually have to schedule time for relaxation. He flounder looks delicious and a great recipe to try! Gorgeous dish first off, I always cherish each nice dinner with my family…even if my little daughter is smothered and covered in what we are eating. This seems like a romatic dish to me! Lovely. PS, I will have a guest post to you in a few days! Thanks again. I have never eaten a stuffed fish before but I am a big sucker for Mornay Sauce. Yum! The combination of flavors with the stuffing and the sauce with the cheeses…and it looks beautiful too! Of course, I'd be fully satisfied to end it with a few pieces of toffee 🙂 I'd love to be entered. I hope you and your Sweet Valentine enjoy some rest, relaxation and romance! Toffee!! I would LOVE to be entered to win that 🙂 Thanks for the chance Chef! Although I do love Toffee more than fish, I am very much hoping to come around to it more with your fantastic recipe ideas. Happy Valentine's Day! I'm happy the weather is getting better for you. This fish looks fantastic! I love the stuffing. I'm sure your wife understands the time you spend here when there are lovely meals such as this one. :)Have a great week Dennis!! ooh I haven't had flounder in ages. That really looks delicious! I've found that sorghum is a great GF substitution for flour in bechamel/mornay sauces- which I use frequently when I make galettes. Thanks for a mouthwatering post- and yes- I'd always be happy to enjoy a pound of Toffee! Have a great day! I've always been a big fan of flounder, and this looks delicious Dennis. Count me in on the toffee! Lovely fish! Oh, and yes I'd love to win the toffee! That flounder is impressive and you've got me inspired again on the fish front. Inspiration again how the other half can often become frustrated how much computer time eats in but when you are producing seduction on a plate like that, Dennis, I'm sure all is forgiven instantly! Glad to hear you're getting warmer weather finally. Wow Denis, that's the best flounder dish I've seen in a LONG time! It's beautiful and comforting. 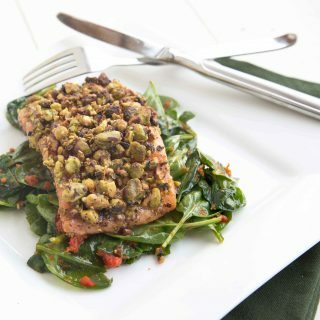 A great way to fancy-up inexpensive fish! I am loving the flouder recipe. It looks lovely. Yum! That looks amazing! Thanks for sharing it! Perfect, perfect fish dish!! And toffee giveaway…count me in!! The stuff flounder looks delicious, Chef! I had something very similar to this at a restaurant recently and considered recreating it at home… thanks for the additional nudge!! P.s…I'd LOVE to win the toffee!! YUM!! Another amazing dish. 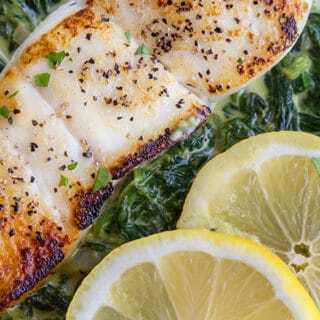 I love flounder and spinach, so this is a winner in my book. I would love to win the toffee, and serve it at my Bunco party. My husband doesn't like that I spend so much time with my blog, and reading others blogs, but we have had some amazing meals. He also cooks for the blog, but I do all of the blogging. Maybe someone should do a post of how blogging is affecting their family. This sounds/looks fantastic! With the goat cheese and bleu cheese this stuffed flounder has to go on my to-do list! 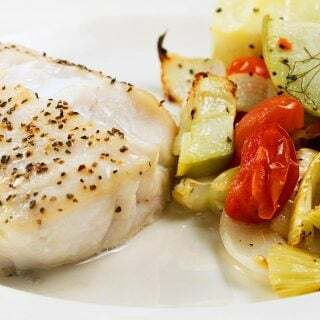 Love this fish recipe, I am excited about making it soon. My husband doesn't really love how much time I spend on my blog either (or on other people's blogs, checking out their great food!). But he is the beneficiary of many a great meal because of it so he tries not to complain. ES una receta muy curiosa, interesante. To get fresh fish is about a 60mile round trip. I don't do it often and usually get some to freeze too ….. but fish from the freezer isn't great either. Oh well – until I find a better source closer to home, we'll just need to dream of your photos. Oh my yes, I want o win the toffee! What a lovely recipe, Dennis. I always see flounder at my store but never grab it because I never have any ideas! This will be the perfect challenge and new recipe to try. Thank you so much! This recipe is a keeper! I happen to enjoy flounder, or most seafood for that matter! Thank you for sharing this wonderful recipe! If you'd like dessert stop by my blog for a visit! LOL!!! Hope you and the Mrs. have a lovely Valentine's Day!! My weekends are jam packed with projects and to-do lists as well! I always try to slow down and take the time to make a little fancier meals though 🙂 This one looks fantastic and that toffee sounds delicious! Your flounder looks delish, Dennis, but I have to tell you I'm here for the toffee! We LOVE Enstrom's toffee and have given it for Christmas gifts for many years. We don't usually indulge for ourselves. We've loved it for over 30 years and I would LOVE to win some! It is the BEST!! 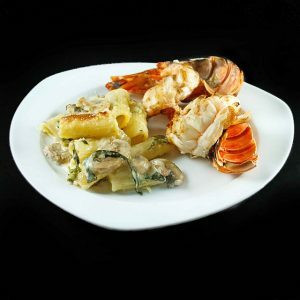 It look delicious, it is a recipe that would make any dinner special. Chef I'm so enjoying all of your fish dishes. And weekends should be a time of rest for you, so take it easy and relax. Thanks for sharing! I haven't had stuffed flounder in a really really long time, since I was a girl!!! This looks so delicious Dennis, I really want to try this for my husband to surprise him, I'll keep you posted how it turns out! (I already have some tilapia but will be looking for flounder) – the almond toffee sounds deeeeeelicious, I would love to be entered into your giveaway – Toffee is one of those guilty pleasures I don't get too often 🙂 I hope you had at least some time to relax this weekend, curl up with a good book, a great nap, or doing something totally fun and silly. have a wonderful rest of your evening!! I'm curious to try flounder! I like plain fish very much and I bet Yannick would like it too. You did an excellent job on this! I'm glad you both have been eating better for the most part. Hopefully Spring will be here soon. A few more weeks to stumble through and it's pretty much here! I hope you both have a good week. This is such an inspired dish, Dennis. I love it. And guess what? My husband also thinks I'm obsessed with my blog but like your wife, he's surely been eating well. No complaints in that department! If anything, I've cut back on our normal quick pasta dishes and I'm missing them. Beautiful fish dish. Must try this sometime.